The Samsung Galaxy Tab S3 a new high end tablet with a nice build quality, a very pretty Super-AMOLED-Display and an integrated S-Pen stylus. It’s the first tablet from Samsung that’s shipped with Android 7.0 Nougat and offers very powerful internal hardware. It’s not the cheapest tablet out there though – right now you have to pay around 500 US Dollars. Is the Galaxy Tab S3 worth it? That’s what we’ll find out with this review. Update: There is a new version already – read my Samsung Galaxy Tab S4 review here. The design of the Samsung Galaxy Tab S3 is really nice. Like with the Galaxy Tab S2 we’re getting an aluminum frame but the back is not made out of plastic anymore – instead Samsung is using glass. That certainly looks very nice and feels quite high end but also attracts fingerprints easily. We’ve known this design for a while now from their smartphones. I would have preferred a full metal body but the glass back is better than plastic – it still feels high end. It’s pretty thin at 6mm but not as thin as the Galaxy Tab S2 that still is one of the thinnest tablets out there at 5.6mm. Samsung is giving us four speakers that are built into the sides of the tablet – similar to what Apple is offering with its iPad Pro series. The speakers are really nice and offer a better sound quality than some notebooks. On the sides are also a microSD card slot, a USB Typ C port and the power button and volume controls. There’s also a connector for an optional keyboard cover. The front looks like all tablets from Samsung. Above the 9.7 inch display sits a 5 megapixel front camera and underneath the touchscreen are the four typical android buttons. There’s a fingerprint reader integrated into the home button – we’ve seen this with the Galaxy Tab S2 already and the fingerprint sensor works pretty well. On the back sits a 13 megapixel camera with an integrated LED flash. The cameras are not as good as with some high end smartphones but it’s fine for Skype calls and the picture quality is very good for a tablet. I always liked the Super AMOLED Displays from Samsung and the new panel of the Galaxy Tab S3 is excellent. It’s 9.7 inches big and has a resolution of 2048 x 1536 – that’s a nice resolution and icons and text look very sharp. We’re getting very good viewing angles here, the display is very bright and colors have a nice saturation. Over all I really like this display, yes I would even say it’s one of the best we’ve seen so far in a tablet like this. There are a couple of competitors out there that offer a higher pixel density, but because of the nice colors and the high brightness I like this one more. It’s even possible to work with it outside in the sun – that’s not the case with most alternatives. The Galaxy Tab S3 comes with a Qualcomm Snapdragon 820 octa core processor. This is not the newest chip out there but the performance is still very good. Sadly most manufactures don’t put their newest high end chips into their tablets even though they use them in their smartphones. But, as I said, the performance of the Snapdragon 820 is still good. It’s an octa core chip with four cores clocked at 2.1GHz and the other four clocked at 1.6GHz. We’re getting 4GB of RAM and 32GB of internal storage – a bit more would have been nice but at least there’s a micro sd card slot. During my whole test the performance was very good, I’ve got nothing to complain about here. All apps I tried did run very smoothly, including the Chrome browser with a lot of tabs opened. The same goes for the multitasking split view mode in which you can open two apps at the same time. I tried a couple of games like Asphalt Extreme, Modern Combat 5 and Riptide GP Renegate. All these games did run without any problems or lags. So if you’re looking for a gaming tablet you’ll be quite pleased with the performance of the Galaxy Tab S3. My benchmark tests show this as well. In AnTuTu I got 146772 points which is the best result of any android tablet I reviewed so far. On the single core test in Geekbench 4 the Galaxy Tab S3 got 1730 points and 4200 points in the multi core tests. Interestingly the Huawei MediaPad M3 is a bit better in Geekbench 4. The Galaxy Tab S3 is Samsungs first tablet that’s directly shipped with Android 7.0 Nougat. They did release an update for the previous version though and in fact it’s quite nice how often Samsung is releasing updates for their high end tablets – certainly not perfect, but better than most. It’s very likely that the Galaxy Tab S3 will get at least two major updates – that’s only a guess based on the past, Samsung did not promise anything. On Android 7.0 Nougat runs Samsungs own interface that almost did not change at all compared to previous versions. If you used a smartphone or tablet from them in the last couple of years you’ll be very familiar with the interface. I don’t like the integration of Flipboard into the homescreen but that’s easily disabled. Next to a couple of apps from Samsung there are also a couple from Google and Microsoft preinstalled. Besides that they did not include many apps with this tablet and that is awesome. I didn’t like the overloaded interface we were getting with Samsung a couple of years ago, this is much better. Thanks to the good performance the split screen view or multitasking feature is very usable. You can activate it by pressing and holding the recent apps button. We’ve known this feature from Samsung for a long time but now it’s integrated into Android itself. We’ve known the S-Pen stylus for a long time now, since the first Galaxy Note. In fact Samsung was the one who made a pen popular again. Now most manufactures have something similar –even Apple. The new S-Pen is a lot thicker than the ones from their smartphones which makes it way more comfortable to hold for a long period of time. The downside is that there’s no room inside the tablet to store it. It’s a bit disappointing that the pen is completely made out of plastic – only the little holder strip is metal. So it does not have the same high end build quality as Microsofts Surface Pen or the stylus from Huaweis MateBook. But alright, you’re using a plastic pen, it’s not too bad. Like usual Samsung did include a couple of special software features for the S-Pen. We’re getting the Samsung Notes App which is a note taking app that we’ve known for a long time now. Samsung is even including the Air Commands that have been part of the Galaxy Note Series for a couple of years as well. With these you can take screenshots and write on them or use the translate feature to quickly translate text anywhere. Another interesting feature is the ability to write on the screen even though it is turned off. If you’ve got the screen of your Galaxy Tab S3 turned off you just have to press the button on the stylus and hold it onto the touchscreen and you can immediately start to take notes. Yes, you don’t have to unlock the screen first. That way you can start to take some notes very quickly. Inside the Samsung Galaxy Tab S3 is a battery with a capacity of 6000mAh. According to Samsung it should last for up to 8 hours while surfing the web. Under certain conditions that might be true but it obviously depends on what you’re doing at which brightness. In my battery test I got a runtime of 12.5 hours. To get comparable results I’m always doing the same battery test in all of my reviews. I’m watching an hd video over and over again until the tablet shuts itself off. The brightness is set to 50 percent, WiFi is activated and there are occasionally coming notifications in from Gmail. Apps like Facebook are not installed. As you can see in my comparison chart the battery life is pretty good but not the best. That’s what I expected though because we’ve got powerful hardware here and a big, high resolution display. Alright, in my opinion the Samsung Galaxy Tab S3 is the best android tablet you can get right now. That’s mainly because of the very nice display – and that’s one of the main features of a tablet. I would have loved to get a full metal body here, but it still feels high end. The performance is very good and the integration of the S-Pen stylus is excellent. The Galaxy Tab S3 is quite expensive though and if you want as much value for your money as possible you might want to consider getting a cheaper but also good alternative like the Huawei MediaPad M3 or ASUS ZenPad 3S 10. It might be worth it to invest a bit more money though – well, depending on how long you plan to use the Galaxy Tab S3. The reason is that Samsung is offering software updates for their high end tablets a lot longer than most competitors. For example, the Galaxy Tab S got an update from KitKat to Lollipop to Marshmallow while the Galaxy Tab S2 got an update from Lollipop to Marshmallow to Nougat. There are not a lot of competitors out there who offer at least two big updates. Obviously we don’t know how long the Galaxy Tab S3 will be updated but the update history of Samsung is promising. 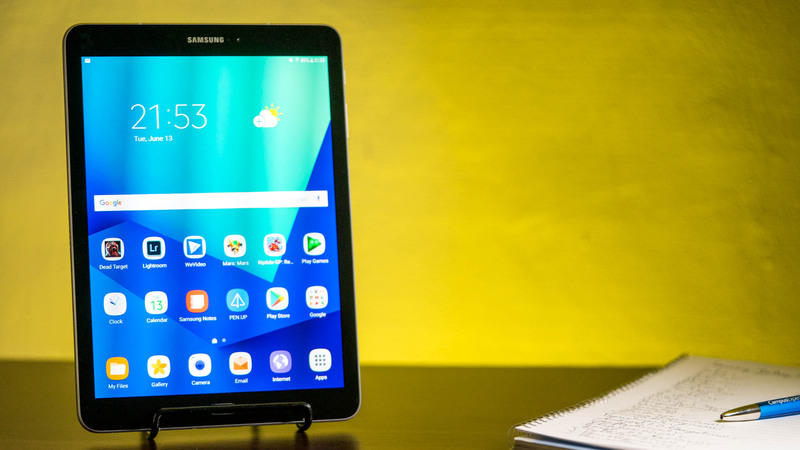 Samsung Galaxy Tab S3 Review:The Samsung Galaxy Tab S3 is one of the best Android tablets. It offers great performance, a very pretty display, and a good battery life. At the same time, it has all important features including a fingerprint reader and S-Pen stylus. Lenovo Tab 4 8 & 10 Quick Review: Best Cheap Tablets?